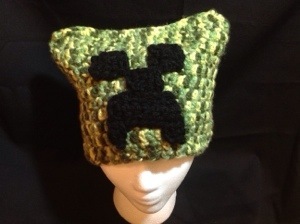 Feeling a little green around the gills, like Creeper here. Allow me to set the stage. Between Christmas and New Year I hosted Christmas and two birthday parties with my parents staying with us in our small home. As is usual for this time of year in our house, the childrens’ Christmas toys littered the living room for most of this past week for one reason: we don’t have any space to store any new items. We are maxed out. To store a new item requires throwing something big away or reorganizing a whole storage area. I’m sure many parents of young children can relate. Plus, when there’s no space to store things it is unreasonable to expect that the kids will keep things tidy because they don’t know where to put things either. Our living room was littered with arrows, Legos, suction cup darts, books, boxes, chargers for Air Hogs, Christmas cards, crumbs… oh the horror, the horror! But we were expecting friends to come over last night so clean it up we must lest we be judged “slobs”. It took me three hours to clean the first floor of the house. Because of the century it took to get the house back in shape I ran out of time for a formal “workout” before we had to meet friends for dinner. Nevertheless, I reason that three hours of cleaning, organizing, sweeping, vacuuming, and scrubbing is plenty exercise for any human and I’ve decided that it counts as a Janathon workout. Calorie Count online says the kind of cleaning I was doing burns 200 calories per hour. Not bad. For good measure I did 100 situps before bed. Then, the fun part. I threw up in the middle of the night. I’ve been feeling like I’m getting sick for a couple of days now, and that feeling proved true last night. Now I lay in bed feeling sorry for myself that I can’t get up and go hiking as I’d planned. But instead of moping I’m focusing on all I have to be grateful for. My husband happens to be home today and he is taking care of me and the kids who are happily entertained with a friend who has come over to play. A book I really wanted to read arrived from Amazon last night. The ground floor of my house is spotless. Overall, I’m golden. My illness will soon pass and in the meantime I have a lot to be grateful for. Life is good.